Help stop the Primate Safety Act-there is no need for this bill!!! What do lawmakers know about animals and yet they are willing to take away the rights of Americans to own their property…now attempting to get the federal government to make current legal owners of primates, wildlife criminals by making legally acquired pets, illegal. Below is an active petition needing only a few more signatures-lease follow the link and sign so that the petition will be sent!!! Animal Rights Activists Are Back Doing Their Monkey Business. With the recent chimpanzee attack on Charla Nash and death of the Chimpanzee Travis in Connecticut, all the Animal Rights (AR) groups are spinning their message: from the Humane Society of the United States to Primarily Primates. They are promoting their attempts to ban these animals (and others) from private ownership. Never mind that this is a rare and unfortunate event. I have not seen any commentary on what safety precautions could have been taken. The woman used a butcher knife? There are a multitude of non-lethal methods to break off an animals attack. The best answer coming out of the AR groups is banning the possession of such animals. They want to make the possession of such animals evil. The fact is that if it were the common household dog (other than pit-bull or wolf dog) that did the attack and sent some one to the hospital, it would just be a statistic, rather than world wide prime time news. They mention 42 non-human primate attacks on humans in the past four years, yet no deaths. Maybe things should be put in perspective: in 2001, 494 people drowned in pools. These people are dead and we are not calling for banning people’s ability to get a pool. On average about 800,000 people a year end up in the hospital due to dog bites/attacks and about 18-30 die. Worldwide, from 1950 thru 2008, there have been 1,300 accidents with fatalities involving commercial aircraft. We are not banning airplanes; we find out the cause of the accident and make flying safer. Yet when a person gets attacked by a primate, all primate ownership is portrayed as evil that should be abolished. Maybe we should abolish beds, chairs and furniture, since about 900 people a year in the US die from falling from them. We should focus on making it safer to own such animals and prevent future incidents. Rather than letting AR groups use a tragic incident to push their agenda of banning the ability to have animals. 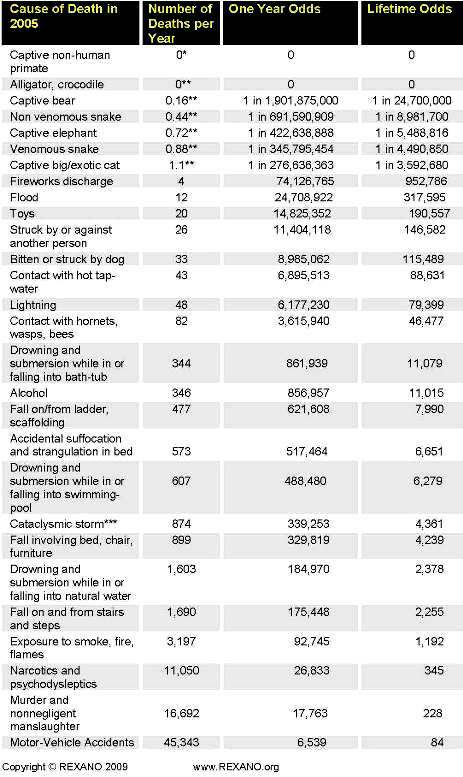 TOTAL NUMBERS AND ODDS OF AN ACCIDENTAL DEATH IN THE USA BY CAUSE OF INJURY in 2005: comparing human fatalities caused by captive exotic and wild animals (average from 1990 – 2008, http://www.rexano.org//Education.htm ) to deaths caused in every day life in 2005. REXANO, www.rexano.org, only used fatalities numbers since all deaths are reported and there is only one degree of death. Injuries in all walks of life range from life threatening to simple Band-Aid fix, and many go unreported. The average life expectancy of 77 years was used to calculate the lifetime odds. The odds are statistical averages for the whole U.S. population. *In 1997 in Atlanta, Georgia, a Yerkes primate researcher supposedly died of herpes B after she was splashed in the eye with bodily fluids from a rhesus macaque; this can NOT be classified as animal ‘attack’, just like a nurse or doctor being accidentally infected with a blood from an AIDS patients can not be called a murder. ~ by topcatsroar on August 28, 2014.